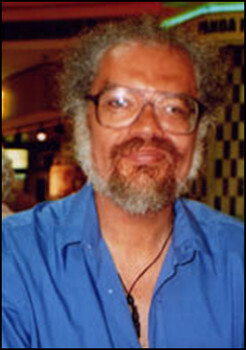 After DAW killed the fourth Imaro novel, for nearly twenty years Charles R. Saunders’s published swords & sorcery output was limited to only a few short stories. Since 2006, starting with the reprinting of Imaro, new books from him have been appearing at a furious rate. In addition to new novels starring his established S&S characters, Imaro and Dossouye, he introduced a new pulp hero, Damballa. 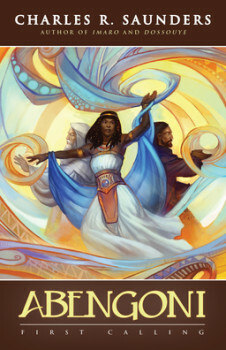 Abengoni: First Calling (A:FC) is the first book in Charles R. Saunders’s foray into epic fantasy. From one of the masters of the 1970s golden age of swords & sorcery comes a project in the works for the past decade. And thanks to Milton Davis’s MVmedia, it’s seeing the light of day. When Saunders first created Imaro, his literary inspiration was Robert E. Howard. In this book, the influence of J.R.R. Tolkien is at work. He has specifically cited the two authors as his main influences. But in both cases, what he wrote was inspired by larger issues as well. When I was writing Imaro, I often felt as though I were channeling the spirit of Malcolm X – the spirit of rebellion. When I was writing Abengoni, I felt as though I were channeling the spirit of Dr. Martin Luther King, Jr. – the spirit of reconciliation. In that essay, he describes how he had long planned to write an epic fantasy where an Afrocentric culture and a Eurocentric one could come into contact as equals without the exploitation and racism that occured when that happened in the real world. And that’s exactly what he does in A:FC. This world stands in stark contrast to the one of the Imaro books, where blacks fared badly when they first met imperialistic, Lovecraft-style-gods-worshipping whites. I also like his mixing of some of those standard European fantasy tropes into the African ones, for example Abengoni has its own kingdoms of dwarves and elves. Abengoni is a tropical continent and Matile Mala was the greatest empire to ever exist on it. As with the rest of Saunders’s fantasy fiction, this world is modeled on African cultures and traditions. Now Matile is only a rump state, barely clinging to an enclave around its once magnificent capital city, Khambawe and taking tribute from the handful of small towns and cities that still pledge fealty to the emperor. The shriveling of Matile came at the end of a horrible civil war against a breakaway colony, Uloa. Both sides used powerful magic of which they eventually lost control. Most of Matile’s cities and many of the islands of the archipelago of Uloa were destroyed. The primitive Thabas, hill tribes enslaved by Matile, rose up and slaughtered their masters wherever they found them. Distant trade colonies were abandoned or absorbed by the surrounding local states. Other parts of Abengoni were overrun by creatures ravaged and transformed by magic. Even the Jagasti, the gods who provided the Matile their power, have abandoned them. Now they just await the day when the surviving Uloans and Thabas overwhelm them once and for all. Saunders spares no time in getting the action and mystery going in A:FC. Tiyana is the vessel of the Jagasti Namah-kwah, the only god who still reaches out to the Matile. First Calling is the ritual in which Tiyana opens herself up to her god, taking on some of her power and thereby answering important questions. But this time she senses nothing. Then Nama-kwah spoke to her in a voice that was not loud; only a whisper that was the barest shade of sound. Then a ship almost hits Tiyana. The Matile fear the strange-looking ship is some new Uloan weapon. Instead, it is a ship from distant Cym Dinath. The white-skinned inhabitants of that land have been cut off from Abengoni for centuries by a giant magical storm, another devastating aftereffect of the war against the Uloans. They once traded with Abengoni but that has been nearly forgotten by everyone. The newly-arrived ship carries a large band of religious pilgrims led through the storm by their god, Almovaar, to find sanctuary and further his worship among the Matile. The pilgrims’ leader, Kyroun, promises to help the Matile not only stave off destruction, but to regain their place in the world. The disruption — the possibility of a different future than the one the Matile had resigned themselves to — begins to change Matile society almost at once. Whether the change is for good or for evil becomes the central mystery of A:FC. Unlike the single-character-dominant Imaro and Dossouye stories, A:FC is filled with enough characters that Saunders felt obliged to include lists of them all in the back. Spies rub shoulders with thieves who sneak about palaces ruled by emperors and high priests. Tiyana is the character with the most space in the story but she’s not alone in carrying the weight of the narrative. Kyroun and Tiyana’s father, Gebrem, the high priest, are intriguing as they try to figure out how much of the truth each is withholding from the other while rebuilding Matile in the wake of a catastrophic battle. Various thieves and spies are sharply drawn, and work well at exploring the darker crevices of Matile society. Without resorting to a thousand pages (this trim epic is only 368 pages in hardcover), Saunders paints a splendidly detailed world. Matile is collapsing and clutching, as if by a dying man, old rituals from its glorious past, hoping to stave off oblivion for a few more moments. Uloa is driven to insanity by the lust for revenge. All its citizens have given their lives and souls to Legaba, the spider-shaped god of the underworld, in order to secure their vengeance. A hyena was tearing at a nearly naked corpse — the remains of a luckless victim of the tsotsis, stripped of everything valuable and dumped in the street. In the time before the Storm Wars, hyenas never dared to venture near Matile cities. Now, they were as numerous as the packs of dogs with which they sometimes competed. As they did in the wilderness, hyenas disposed of the dead in the neglected parts of Khambawe. This may not seem like groudbreaking stuff but it’s done so well and with such color that it doesn’t matter. Saunders is a viscerally exciting writer who can grab you in a few words, setting a stage or introducing a character that leaves you eagerly waiting for more. Then he delivers, keeping you riveted to the page. Only when the Uloans made their way over the ramparts did the soldiers finally become aware of their presence, as the air shimmered again. A moment later, the dumbfounded Matile found themselves facing a nightmarish horde of spider-scarred, wild-eyed invaders. For a moment, they were startled into immobility. And their recovery came much too late. The Uloans drove their swords deep into the bodies of their foes, punching their weapons’ points through leather armor and piercing hearts and entrails. Screams of agony shattered the silence of the palace, which was suddenly no longer so far removed from the slaughter that was occurring in the city. Once the initial shock of the Uloans’ sudden onlsaught — as though they had materialized from the night itself — passed, Matile soldiers retaliated, hacking and slashing in a frenzy of hatred and fear. Light from the Moon Stars reflected from spatters of blood and glinted in the glaze of dead men’s wide-open eyes. Yeah, I really like A:FC. Saunders avoids the pitfalls I find in lots of contemporary epics: ridiculously long, pointless side plots, and absurd amounts of detail. The prose and plotting in this book is as taut as in his Imaro and Dossouye stories. He knows how to build a book without wasting chapters that distract the reader from the important matters at hand, and as a reader I’m extremely grateful. And there’s lots more to Abengoni:First Calling beside the little I’ve described here. Interlaced into the main story are the histories of the Matile and the Uloans. Like in any good epic, there are plots and characters that appear to be completely unrelated to the greater unfolding story. With consummate skill, Saunders slowly weaves them in, a strand at a time, tying them all together by book’s end. He also keeps them under tight control, never letting them wander too far afield before bringing them neatly back in. Of course being only the first book in a series, as much as it resolves several big things, the end also sets the stage for bigger and darker things to come. So, yeah, I can’t wait for the next book. So what are the elves and dwarves of this world like? Abengoni’s elves, the Wakyambi, remain a little mysterious. The Abengoni dwarves, the Tokoloshe, are an important faction in the book. Like most fantasy dwarves, they are subterranean dwellers, but they also possess powerful magic. In the real world, tokoloshe are mischievous spirits in Zulu mythology. I am not really looking for Epic fantasy, with politics and kingdoms at stake, and stuff like that. But this article does make me want to check out some of his older stories. He sounds like a really interesting writer, of whom I never heard before. @Martin Kallies – While the fate of the Matile Empire is at stake in A:FC but not from politics but crazy magic and nasty gods. This is epic fantasy from a swords & sorcery writer so it’s lean and mean. As to Charles Saunders’ other books, I can’t recommend them enough. The most recent Dossouye book, Dossouye: The Dancers of Mulukau, and the most recent Imaro book, The Naama War have been reviewed here at Black Gate. Sounds like a fascinating read! I’ll have do some research in Saunders’ work–thanks! I’m going to have to check this one out.